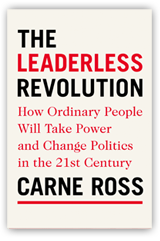 The Leaderless Revolution is published in the UK by Simon & Schuster and in the US by Blue Rider Press, an imprint of Penguin. There are few books that attempt to interpret the world and how it is run. The Leaderless Revolution offers a refreshing and pungent contrast to the Panglossian optimism of Tom Friedman’s The World is Flat but, like that book, it offers a way of understanding the world of the 21st century that is both clear and easily comprehensible. Carne Ross takes different angles on contemporary issues – economics, politics, the state of democracy, the environment and terrorism – wrapping them into a unified explanation of how money and power function to control the lives of the earth’s inhabitants, such that they feel powerless to affect their collective future. It seems that mankind has settled upon liberal democracy as the ideal form of government. Its triumph with the collapse of communism signalled the end of ideological struggle and thus of history. The Leaderless Revolution will show however that even in democracies, many if not most of the population feel that they are excluded from any agency over the issues that most trouble them, while governments appear less and less able to influence the global problems that threaten our peace and comforts. Mining the rich but little-examined history of anarchism, and updating the philosophy for today’s needs, The Leaderless Revolution offers a refreshing and original prescription for the problems of today. Not only an antidote to our global crises; Carne Ross offers, moreover, a route to fulfillment and self-realisation. 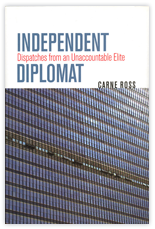 Independent Diplomat: Dispatches from an Unaccountable Elite, (UK: Hurst, 2007 and 2017; US: Cornell University Press, 2007). Though diplomats negotiate more and more aspects of world affairs–from trade and security issues to health, human rights, and the environment–we have little idea of, and even less control over, what they are doing in our name. In Independent Diplomat, I recount my experience, examine what’s wrong with contemporary diplomacy and offer a new vision of how it might be put right.